Their Big Day is here! There is no better way to send your good wishes to the happy couple than with a beautiful design from our Wedding Collection. 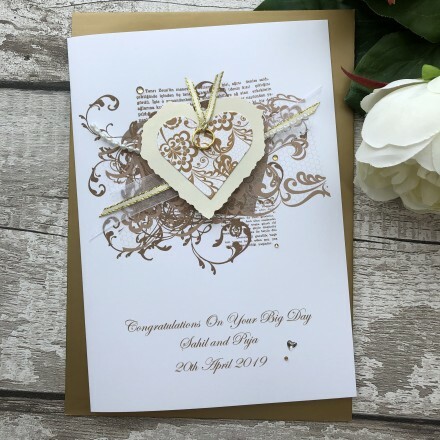 Our selection of exquisitely designed handmade personalised wedding cards to celebrate a very special occasion, offering mix of glamorous contemporary and beautiful traditional designs. This stunning card features an ornate vintage background embellished with a shimmering heart topped with ribbon tied wedding rings, gems and pearls.